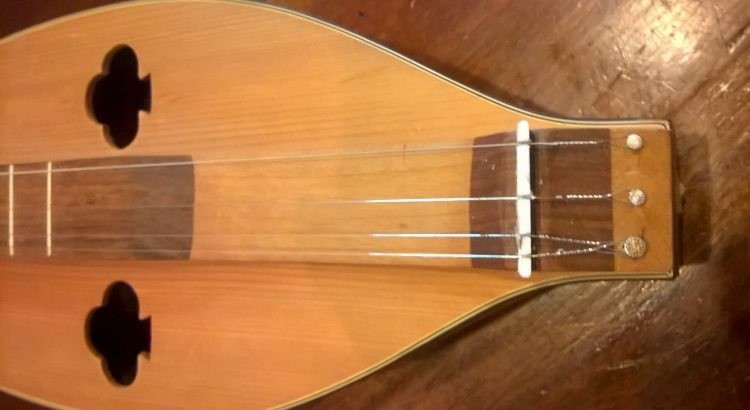 I have a Mountain Dulcimer made by the Washburn Company that I bought over 40 years ago. I used to play it but it has mostly, for many years, hung on the wall as a decoration. One of my young grandkids seems to have an inclination and ear for music. So I ordered some strings. Some of the pins holding the string ends were missing. I never thought they were substantial enough in the first place. I replaced them with nail heads. Then I noticed that the bridge nut was damaged so I searched for replacements on the internet and found some. Then I remembered the tradition of NC mountain instrument makers using whatever materials they had available. They weren’t looking to the internet for help. What I first remembered was someone using cut up pieces of old toothbrushes to look like jewels. They looked better than you might imagine. I decided I could find a piece of rigid plastic, cut it to size and make the string grooves. The bridge nut and the strings are installed and so far so good. Of course the real test, is that of time. And of course, if I were really a craftsman, I would make it out of bone.